Want to fill up your closet with custom-made outfits? Then, all roads lead to New Choice on Dispensary Road. Stacks of Ikats, Kalamkaris, and Chanderis await you, beginning at just INR 150 a metre. About 20 years old, New Choice on Dispensary Road (on the opposite side of all the silver shops and tailors) is a fabric haven. Right at the doorstep, you’ll be greeted by stacks of ikats in deep maroons, blacks, bright oranges, and mellow blues. These will make for great dresses or breezy kurtas. On the opposite end, you can browse through piles of plain Mangalgiri fabrics and also cottons that come with floral prints or are adorned with paisleys. Inside, there’s plenty more to choose from. They have a vast collection of cottons and you can also source more bold and fun prints from their stock. We spotted colourful Kalamkaris with serene Buddhas and Chanderis with delicate designs. You can also pick up raw silk and cotton silks here. 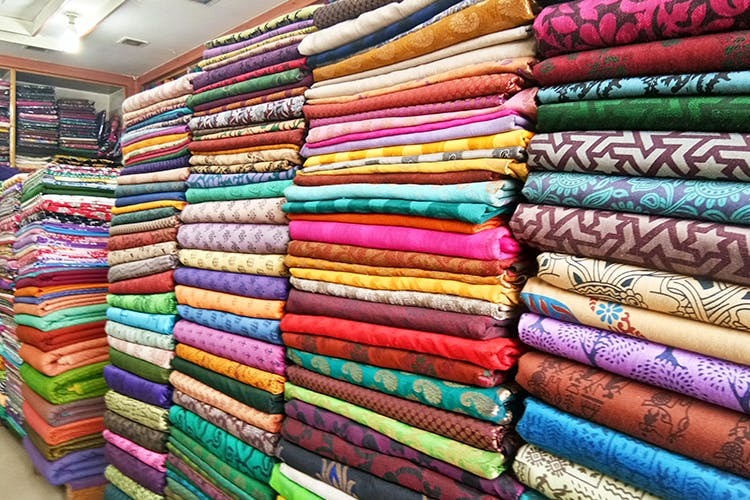 Prices for fabrics begin at INR 150 per metre. The store also offers unstitched, salwar suits in cottons and synthetics. These are mostly everyday wear and would be perfect for work or casual wear. For these, price start at about INR 450. Many of the bolts of printed cotton fabrics here are run-of-the-mill. So, go through the stacks carefully and you are sure to find a hidden gem.